Descendance Aboriginal & Islander Dance Company has continued its commitment to the indigenous community of Palm Island (North Queensland), frequently visiting to facilitate its development and mentorship of the children’s cultural advancement. Descendance s workshops and dance programs culminate in concerts for the community in unison with its sixty strong indigenous children’s dance company. 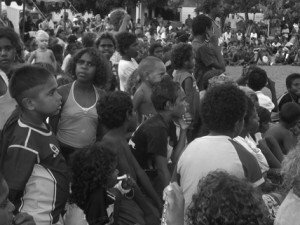 The children of Palm Island are its future and make up one third of its population, Descendance along with Bwgcolman Futures President Robert Blackley and Treasurer Svea Pittman are helping build esteem and confidence into the children through cultural and arts programs giving children positive options and new ideas for the future. Most of the existing housing on the island is old, dysfunctional and in need of renewal, windows are broken, roofs are leaking and plumbing is inadequate, but even more striking is that the community averages twelve persons per house. The unemployment rate on the island is above 90 per cent – double the unemployment rate for all Indigenous Australians. Thousands have left the island because of its appalling living conditions; unemployment and high rate of violence, and have relocated to Townsville. From 1918 onwards The Australian Government relocated people from more than sixty different tribes to Palm Island; historically it was a place where Indigenous people were sent as a form of punishment, The Island is a mixture of people, languages, traditions and customs, Descendance s frequent visits hope to instill positivity and culture back into the community. Descendance also has strong ties to Yarrabah and Mapoon communities in North Queensland, and is developing relations with Black Tank community Alice Springs Central Australia. Descendance conducts educational workshops in traditional & contemporary dance, didgeridoo playing, song, and painting.